How do I get my “@” back? I seem to have broken my keyboard. When I press SHIFT-2, instead of the quotation marks I get an “@” symbol and when I press “@” I get quotation marks. How can I fix it? This problem is caused by having the wrong layout selected for your keyboard. 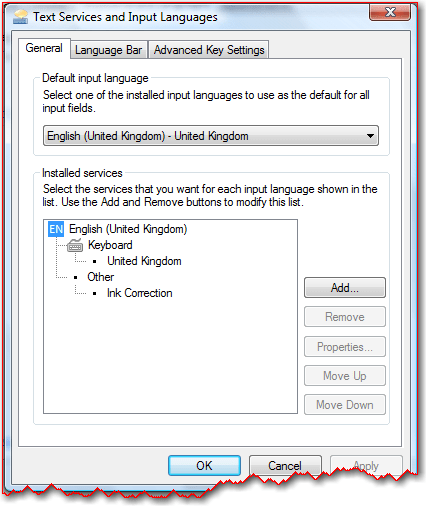 British layouts have quotation marks appear when you press SHIFT-2, while American keyboards have an “@” symbol. It’s actually quite easy to switch it back to what it’s supposed to be, so here’s what you do. If the keyboard layout you want isn’t shown on screen, click the Add button. Click on the small plus next to the langauge you want and then the one next to Keyboard. Click in the box you want and then on OK. It will appear in the Installed Services section and you can then select it in the Default input language menu. It sounds more complicated than it actually is, but once you’ve actually done it, it’s actually quite simple. Let me know if you still have problems. ← Previous Previous post: Can you recommend an MP3 player I can use in my car? Next → Next post: How do I read/write to my CD?